I understand the Maasi people of Tanzania and Kenya have a rite of passage for boys as they become men. Each must journey into the wilderness to kill a lion. Up until a few years ago we hams had a rite of passage. This one dictated by government regulation. Each of us had to journey to the nearest FCC office to be tested. Six of us were seated around the worn table in the exam room of the FCC office in San Francisco. The window shades were drawn even though it was daytime. No fan could dispel the feeling of nervous tension that hung in the air. I'm sure each of us wanted to be there but we each also wanted the next few minutes to be over. I was no different from the others. I wanted to pass this test so that I could advance as a ham. Without a passing tic mark I'm off the air. To add to the pressure, sitting outside in the waiting room is Vance, my Elmer and new step-father. He had passed this same sort of test almost 30 years before. He was good at this and I wanted to demonstrate that I was good also. Only the FCC examiner stood. I forget what he looked like. I was worried about the test, not him, but he had the power of a god. He would say if I continued with my hobby. He gave the instructions and reviewed the requirements. I was to demonstrate that I could copy Morse code sent at 13 wpm. He had a machine that had the code etched onto paper tape. Once started, his machine will send this code at exactly 13 wpm for five minutes. It would not stop, slow down or speed up. To pass I had to copy any one minute perfectly. One minute of code at 13 wpm, five characters per word. One minute, 65 characters, in a row, perfectly. We six each put on our headphones. This was 1967. Ear buds weren't invented yet. These were "cans", two of them, each covering an ear, with a metal springy band across the tops of our heads to clamp them in place. Now I was focused. My world was those cans, my pencil and the government issued lined tablet in front of me. The machine started. Focus, focus, di di di dahhh, "V", that's an "V", write it down. What was the next character? I missed it. Slow down, wait, you're going too fast. But the machine doesn't wait. One minute, 65 characters, in a row, perfectly , that's all I need, focus, focus. The dits and dahs keep coming. I'm hunched over my paper writing as fast as I can figure out what's being sent. I'm focused only on the sound in my ears. I see only the tablet in front of me. Suddenly "ker thunk". It must have been my sweat. Those headphones, slicked by my own nervous sweat, had slid off my head, falling to the table. Quick, put them back on. What have I lost? Maybe five seconds? Five or six characters? Start over. One minute, 65 characters, in a row, perfectly. But in those few seconds, with that ker thunk, I was finished. I could no longer focus. I did fail that time but the world didn't end. I had copied enough code to earn my Technician class license. For a while I'd be WA6AVE using a Heathkit Twoer on AM. About six months later, sitting in the San Antonio FCC exam room (and more comfortable with my ability), I passed the code test. Today CW is my mode of choice. I've been a ham, now, for over 46 years. Hams sort of relate to their calls, their shacks and their radios. I'm no different. I was 15 and a sophomore in high school when I passed my Novice test. The FCC issued me the call WN6ULH. No one else in the world had that call. It was mine and mine alone. Anyone world wide hearing "WN6ULH" would know it was me at the radio, quite a trip for a 15 year old. We lived in Santa Rosa, California and had recently moved across town to a new home. My grandfather, a retired building contractor, remodeled the kitchen for us. He then partitioned off part of the garage for me to use as a shack. He even included the old kitchen counter recovered with plyboard. I had my own work bench and even a built in 3' x 4' table for my station. 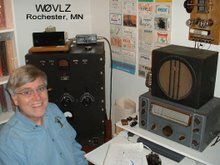 Vance, W6ZZL, helped me find the radios I would use for that first station. In 1967 most ham gear, especially those a 15 year old could afford, had tubes rather than transistors and many were WWII military surplus. Mine were no different. My first receiver, a BC-342, had a "function before beauty" blockish sort of look that fit the battle field it was designed for but it worked fine for me in that northern California ham shack. The Eico 720 transmitter Vance and I found had great 1960 style with its black low slung cabinet, copper trim and satin finished front panel. Used together those two allowed me to work hams all over the US at a time when long distance telephone calls were always expensive. Some 15 year old boys might have dreamt of getting their first car. I already had my radios. I guess I was, without knowing it, firmly establishing myself as a nerd. My Christmas list this year included two Coleman Clothesline/Laundry Reels ( http://www.coleman.com/product/clotheslinelaundry-reel/827E140T#.U07utZmHMR9 ). I replaced the clothesline with 25' of stranded/insulated wire and made up a center insulator with a coax fitting. Now I have a field configurable 30-10 meter dipole. All I need to do is attach the coax and wire/clothesline reels to the center insulator, roll both sides out to the proper dipole length for the band of choice, lock each leg by wrapping the wire around the tab on the reel and then hoist it up in the air. The wire still coiled on the reels at the two ends of the antenna should not be a problem. Spring is close here in southern Minnesota. Soon I'll be able to take it out and give it a try.